Reports this evening indicate that Matt Taylor's time at West Ham has come to an end as it appears he has rejected a new contract offer and at 32 years of age will be seeking pastures new. For much of the early part of last season Taylor seemed surplus to requirements, but having slipped into the side due to injuries to other players, he put in some excellent performances, in many cases displaying a level of mobility that belied his years! However, time is merciless and it seems that next year another club will be benefitting from his cultured left foot. 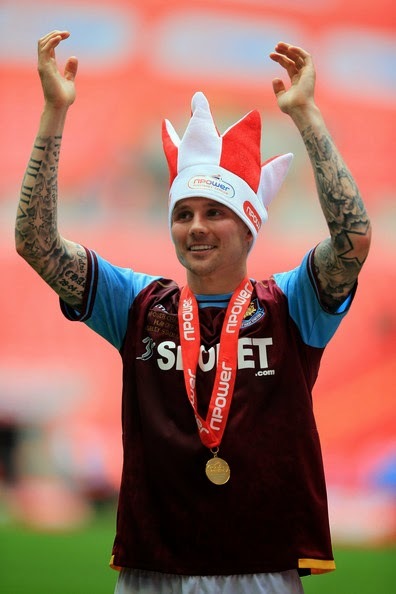 For Hammers fans, we will best remember Matt for his determined run from defence in the championship play off final against Blackpool, which he followed with a deft pass to Carlton 'Killer' Cole who slotted away the all important first goal and settled our jangling nerves after a pretty awful first period. There was knicker-wetting excitement to follow before we crawled home but undoubtedly Taylor's contribution on the day was crucial. Best of luck Matt wherever you roam. Can't complain about his commitment to the cause. Decent servant but time to move on.